With significant government investment in public transport, such as the Gautrain and BRT, it is important to critically reflect on the current state of public transport in the city-region. QoL respondents were asked to identify the main problems experienced on a regular basis in the latest QoL survey. Problems differ somewhat depending on where people live. Residents of the metros were more concerned with the high cost of transport, rude drivers/passengers, and unreliable service. 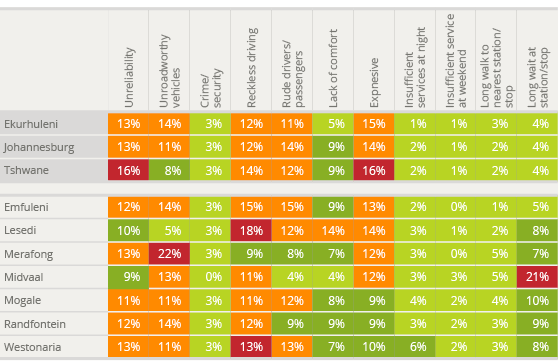 In non-metro areas, problems with unroadworthy vehicles, reckless driving, and rudeness dominate. These trends are consistent with higher use of taxis in non-metro areas. Interestingly, most people do not consider crime and security on public transport as a major problem. 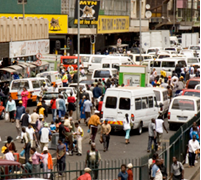 Expensive fares are considered the most important problem by taxi users. Amongst bus and train users the problem is not cost but reliability. These findings are consistent with the state of operations in these industries: bus and train fares are kept low by state subsidies, but taxi fares are not. It is also clearly important to ensure that future upgrading of the public transport system – for instance by replacing taxi routes with higher-capacity bus or BRT services – does not result in fare hikes for passengers (including those who remain taxi users), many of whom fall into the low income group. Affordability is also a key concern among people walking where they want to go, suggesting that many non-motorised transport users do so not by choice but because they cannot afford to travel by any other means. 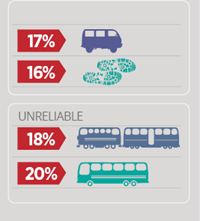 Expensive fares are considered the most important public transport problem by taxi users (17%). Affordability is also a key concern among people walking with 16% stating that expensive fares are the single biggest problem with public transport. This suggests that they do so not by choice but because they cannot afford to travel by another means.